Metallic wood has been created and could be used by architects to design buildings with new strength-to-weight ratios. 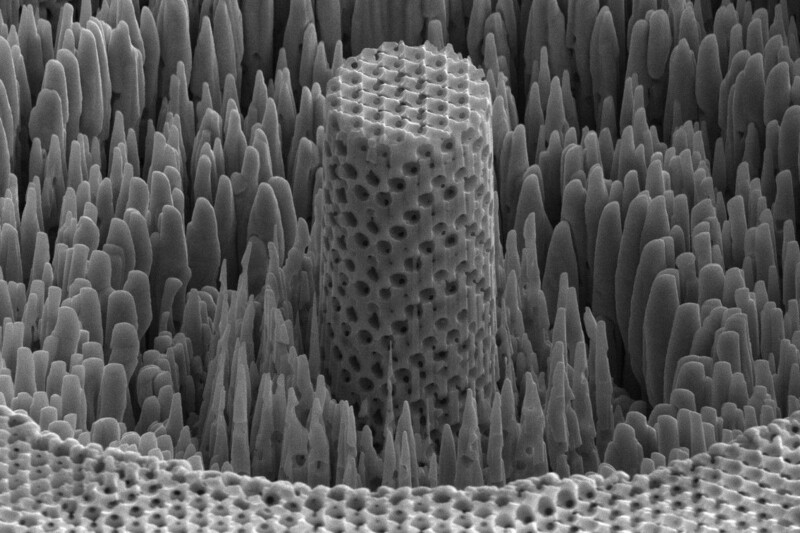 Researchers have created a “metallic wood” that’s as strong as titanium, but light enough to float in water. Right now, they can only produce a small amount of the metallic wood at a time — but if they can find a way to scale-up the manufacturing process, the material could lead to everything from highly durable smartphones to super-light cars. Researchers at the University of Pennsylvania, the University of Illinois at Urbana–Champaign, and the University of Cambridge detail how they created the metallic wood in a study recently published in the journal Scientific Reports. First they suspended tiny plastic spheres, each a few hundred nanometers wide, in water. Then they evaporated the water, which caused the spheres to stack in an orderly pattern. After that, they used a process called electroplating to coat the spheres in nickel. Finally, they used a solvent to dissolve the plastic spheres, leaving just the nickel lattice in place. About 70 percent of the resulting material is empty space, but this low density isn’t the only thing the material has in common with wood. It currently takes the researchers about a day to produce a postage stamp-sized piece of the metallic wood. But if they can effectively scale up the process, the potential uses for the material are numerous. Architects could use it to design buildings with new strength-to-weight ratios, and electronics manufacturers could coat their devices with it, giving them added durability without adding much weight. By filling the pores with chemicals, researchers could even potentially transform the material into a lightweight, rechargeable battery. Timothy J. Rupert, an associate professor of materials science and engineering at University of California, Irvine, who wasn’t involved in the research, also sees potential uses for the metallic wood in transportation. In other words, this metallic wood could allow electric vehicles to go much farther on a single charge, eliminating one of primary issues currently stopping some drivers from trading in their fossil-fuel powered cars for climate-friendly EVs.